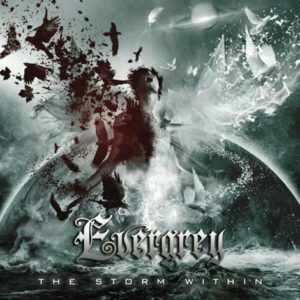 Evergrey’s tenth studio record, The Storm Within, is a solid successor of the comeback release Hymns of the Broken two years earlier. After numerous line-up changes and shifts in quality, the band seems to be back in stability and strength for good. As with so many Nordic bands, the Swedish progressive metal quintet convinces with a melancholic sound that serves as a consistent theme throughout the eleven new songs. Another constant is the intellectual lyrics that deal with inner struggles and relationship issues. I wouldn’t call this album a conceptual release, but it does have a coherent structure. The Storm Within is strong and persuasive on many levels. One must point out the great melodic guitar solos that build climaxes in almost every track. The extensive solo in “Passing Through” is exemplary of the band’s capacity to merge heartwarming guitar with otherwise sinister sounds dominated by cold electronic keyboard samples, simplistic rhythm guitar, low bass grooves, and a steady drum play. Another winning element is the charismatic melancholy vocal performance that manages a good balance between mellower parts and powerful passages. Band leader Tom Englund shows off his talent in the diverse track “Someday”, which varies steady melodic passages in the verses over a calm and fragile bridge, to powerful and emotionally intense sections toward the end. To add even more diversity, several songs feature female choir and string passages. These work particularly well in the epic opener “Distance”. The record also features two guest vocalists. Tom Englund’s wife performs in the smooth ballad “The Paradox of the Flame”, which focuses entirely on the soulful vocal parts that complement each other perfectly. Floor Jansen of Nightwish and ReVamp fame even sings on two tracks and she does a particularly great job on “In Orbit”. Her vocal skills are employed very well in this song, which finds a better balance between smooth keyboards and more determined guitar riffs than in many of the overloaded and pompous tunes of her main band. Another track that sticks out is “My Allied Ocean”, due to its unrelenting heaviness that ventures nearly into thrash metal territory and offers a welcome change of pace and style. Along with the opener and the duet with Carina Englund, this is my favorite song on the album. All these strengths aside, this album also has a few weak spots. I must point out the rhythm guitar work. Most songs employ simplistic, chugging modern metal riffs that I might expect from a band like Disturbed, but not from an experienced progressive metal act. The band should try to spice things up and vary its rhythm guitar work a little bit more in the future, since this just seems lazy. A debatable point is the production, which sometimes sounds a little bit clinical and cold in my opinion. This concerns the guitar work in particular. Even though this approach adds to the sorrowful soul of this record, a warmer and more organic production would have added to some songs. As a last point, this album is maybe missing a truly outstanding song despite a consistently high quality level. The record works perfectly as a whole, but at least one catchier anthem would have lent this album a pleasant shade of lightness to ease the overall challenging listening experience. In the end, The Storm Within is a strong new album that utilizes Evergrey’s strengths of intellectual moodiness, emotional guitar solos, and soulful vocal performances by the lead singer and numerous guest vocalists. I wouldn’t say that this album is a candidate for album of the year, but genre fans should definitely give it a try. Those who like groups such as Borealis, Kamelot, and even Katatonia should appreciate this very good release.